Health-Ade Kombucha is a bubbly probiotic fermented-tea, using only raw organic cold pressed produce to create each unique flavor. Their new Super-Tea line is a special union of two powerful foods—natural botanical super foods and raw, organic kombucha. Health-Ade brews in small batches to allow for absolute control over quality, ferments in 100% glass to prevent any plastic or metal leaching. They never use fake fermenting agents, flavourings, dyes, or chemicals. Health-Ade makes the best tasting, highest quality kombucha you can buy. Health-Ade inspires people to trust their mind, body and gut- so they’re happy and healthy. ACTIValoe is the most bioactive aloe water on the market today, loaded with aloe, electrolytes and vitamins. The ACTIValoe® in each bottle of Detox Water contains the power of aloe’s naturally-occurring polysaccharides, which are long chains of sugar molecules, clinically proven to support immune function, health digestion, nutrient absorption and youthful-looking skin (improvement in skin elasticity). 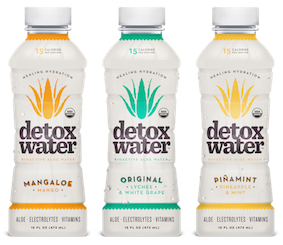 Patented technology allows the makers to isolate the most effective polysaccharides within the plant and maintain batch-to-batch consistency of ACTIValoe® gel flakes in every bottle of Detox Water. Batch-to-batch consistency is the key to delivering optimal benefits at all times, including supporting digestive health, nutrient absorption, skin health and immune and antioxidant defense. Detox Water is your healthy healing hydration alternative that not only quenches thirst and tastes delicious, but also delivers the plethora of health benefits associated with drinking the most premium aloe in the world. This drink guarantees high retention of the many benefits of aloe vera. Only 15 calories, we love the Pinamint, a refreshing pineapple and mint.